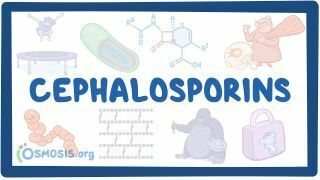 Osmosis: Cell wall synthesis inhibitors: Cephalosporins. (2019, April 24). Retrieved from (https://www.osmosis.org/learn/Cell_wall_synthesis_inhibitors:_Cephalosporins). Ceftriaxone is an antibiotic useful for the treatment of a number of bacterial infections including pneumonia, ear infections, skin infections, urinary tract infections, gonorrhea, pelvic inflammatory disease, septisis, bone and joint infections, intra-abdominal infections, and meningitis. It is also used preoperatively to reduce the risk of postoperative infections. It is administered by intravenous or intramuscular injection. Cefazolin, also known as cefazoline or cephazolin, is an antibiotic used for the treatment of a number of bacterial infections. The drug is usually administered by either intramuscular injection (injection into a large muscle) or intravenous infusion (intravenous fluid into a vein). Cefoxitin is a cephamycin antibiotic (trade name Mefoxin) often grouped with the second-generation cephalosporins. Its activity spectrum includes a broad range of gram-negative and gram-positive bacteria including anaerobes. It is inactive in vitro to most strains of Pseudomonas aeruginosa and many strains of Enterobacter cloacae. are second generation cephalosporins that are used to treat gram negative bacilli, such as Enterobacter aerogenes.